You knew my love of scones was going to morph into some little chocolate number. 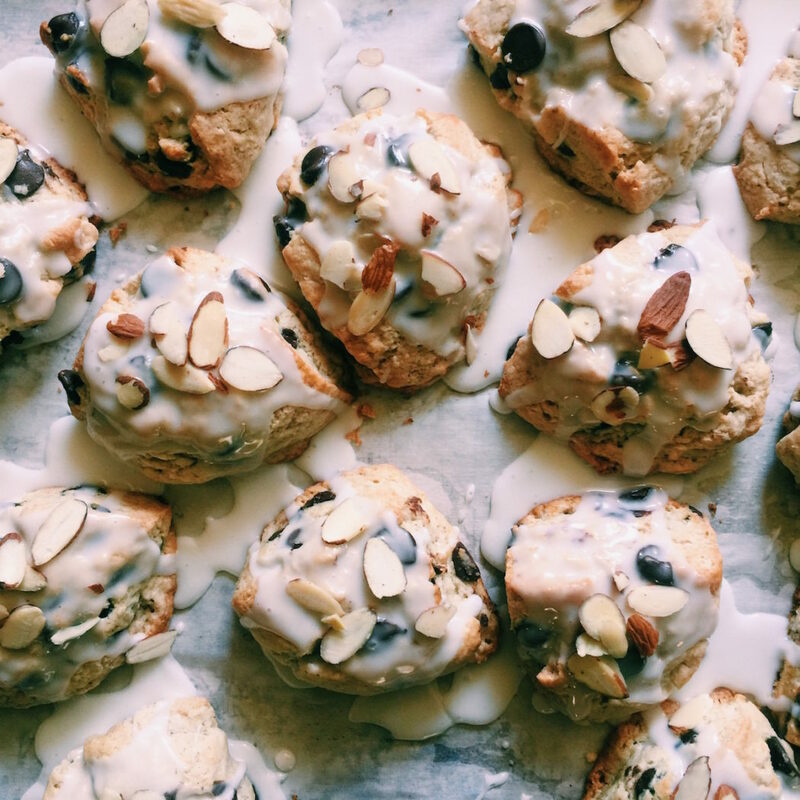 I’ve actually been hanging onto this chocolate almond scones recipe for probably a year. I know. Sorry. They’re so good. But I needed a bit of a scone sabbatical. Once I stopped baking them for the bakery we needed a break. But enough time has passed and now we’re in love again. These are my classic cream scones… We add in some almond extract to the dough, hella chocolate and then sprinkled some almond slivers on top so we know what we’re biting into. As with all of my scones, these are perfect to make ahead and freeze (unbaked) for a rainy day. Just tack on a couple of extra minutes to the bake time, no need to defrost first. Looking forward, what types of baking recipes are you all looking for? I feel like we’re lingering between citrus and on the cusp of berry season…but what’s right now? Photos keep popping up of rhubarb, but it’s not really my jam. Should it be? Should I go there? Are we craving pies? Cakes? Muffins? Breakfast stuff? 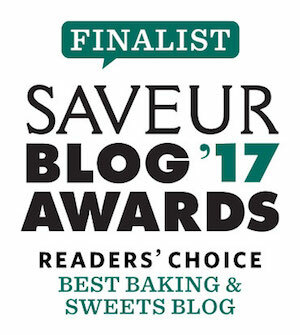 What about savory baking? Bagels? My favorite baguette recipe? Give me some feedback in the comments below…I would love to hear! If you don’t care for chocolate you could easily substitute dried cherries or cranberries for the chips. If you don’t have a large freezer that can accommodate a baking sheet, place your scone discs on plates to chill prior to baking. A quick note regarding the photos…I made a double batch when I was photographing these. So don’t be confused…you separate the dough into four, equal-sized discs, not the eight you see in the photos below. 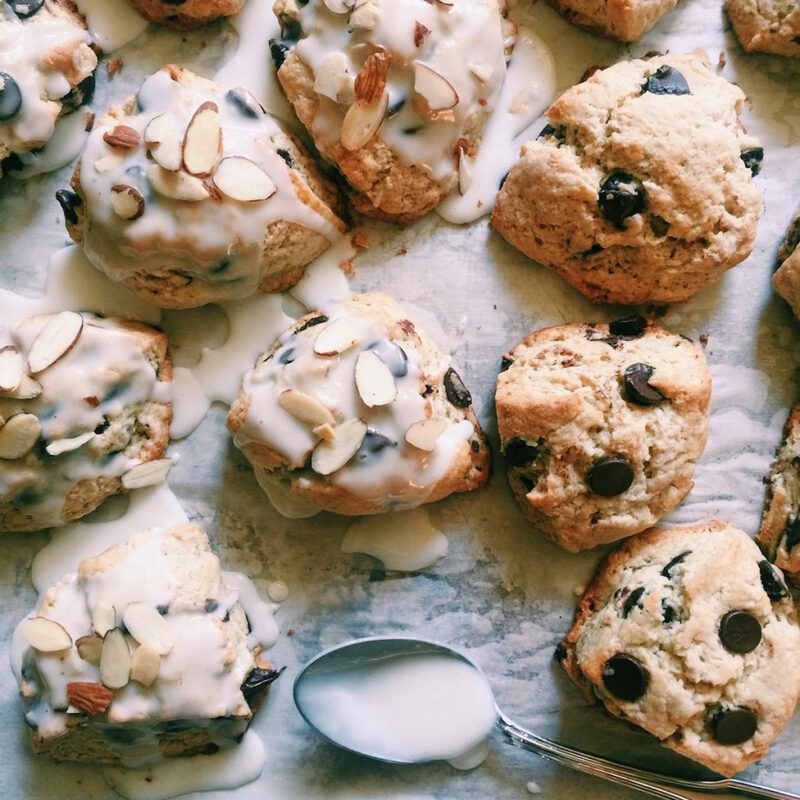 I hope you enjoy these chocolate almond scones as much as I do — let’s get our bake on! Mix the 3/4 cup of cream, egg and almond extract together in a small bowl and then drizzle over the flour mixture. Using a fork, stir until it just starts to form a cohesive mass. 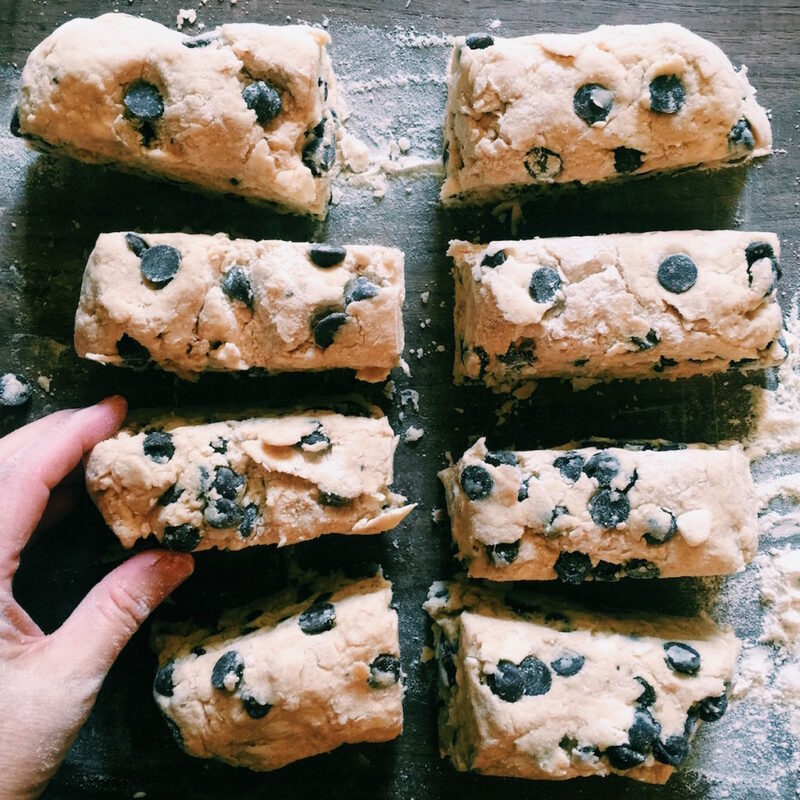 Sprinkle the chocolate chips over the dough and gently fold them in until they are evenly distributed throughout the dough. Lightly flour a clean surface and separate the dough into four equal-size lumps. Mold each lump into a disc, about an inch and a half thick, with nice, crisp 90-degree angled sides. 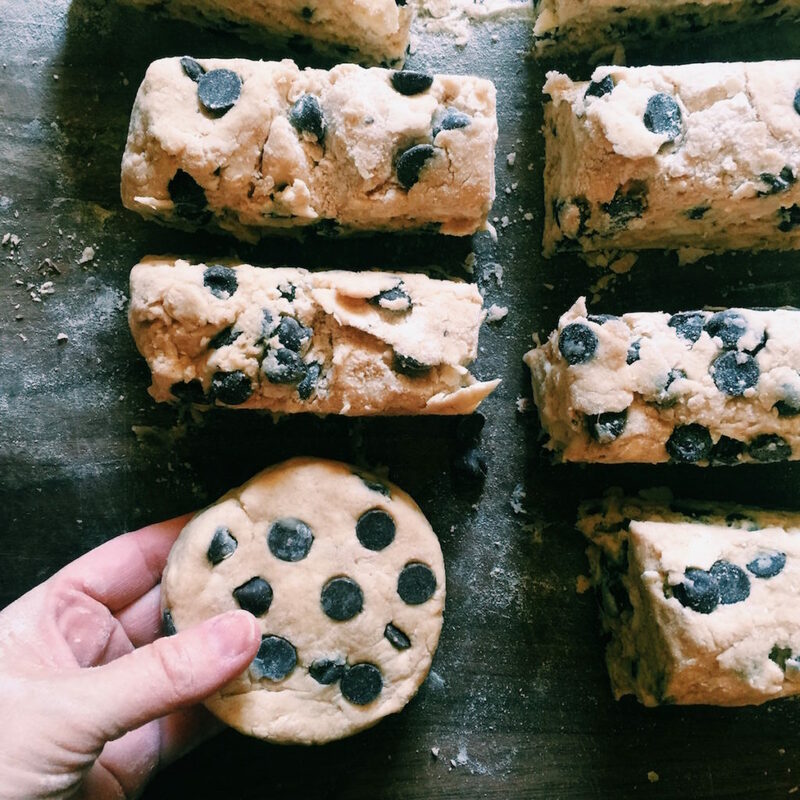 Don’t overwork your dough. Set the discs on the parchment-covered baking sheet. Pop the discs, uncovered, into the freezer. Set the timer for thirty. You can skip this step if you’re short on time or patience…the freezer just helps them get a little more lift off and keep their shape while in the oven. I will also say, that if your dough is on the stickier side (because it’s humid), this will definitely make it easier to handle…especially when you’re trying to cut it. Pre-heat your oven to 400 degrees F and make sure you have a rack in the top third of the oven. When the timer goes off, pull the scones out of the freezer. Using a sharp knife (I love my bread knife for this), cut each disc into four, equal-size scones (you’ll end up with a total of 16). Make sure to cut up and down and don’t use any see-saw action when cutting. You may need to lightly flour your knife in between cuts if it’s sticking a bit. Pull the scones out at least two inches from one another. Put the scones in the oven and set the timer for 13 minutes. After 13 minutes, look at them. I often rotate the baking sheet and give them 1 more minute at this point. How do yours look? Are they nice and puffed up? The slightest bronze happening? When that’s their appearance, they’re done. Let them cool on the sheet, in a draft-free area, for about 15 minutes. Meanwhile…whip up the glaze in a bowl by adding the powdered sugar and almond extract and mix. Add milk, in 1 teaspoon increments, to get to the desired consistency. What’s the desired consistency you ask? Thin enough to pour and thick enough so that it stops in its tracks and doesn’t just fall off of the scone. Grab a large spoon and drizzle the glaze over the tops. Sometimes I like to cover most of the tops and let it run down the sides. Other times I like to splatter, in a Jackson Pollock-like manner. Create your own style. Be a boss. Sprinkle with the almond slivers, if using. You’re done. Happy brunching. 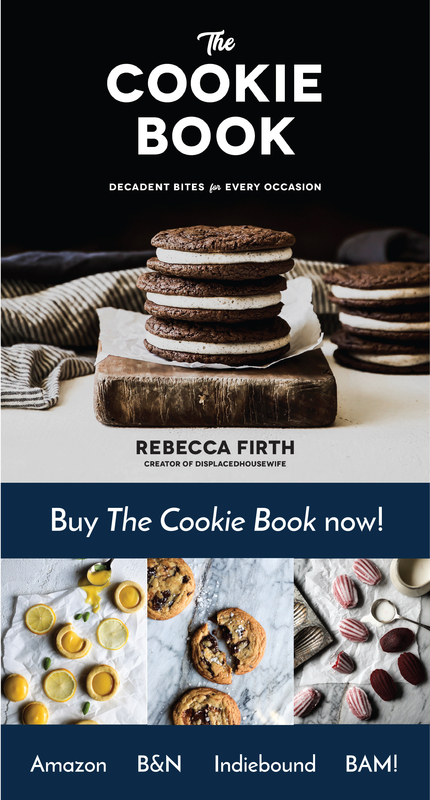 I’m loving these two new-release cookbooks: Joy the Baker Over Easy and Fresh. If you’re looking for an uplifting read, check this out. I’m looking for a good book to lose myself in…any recommendations? Would you pay $100 for an ‘arctic enema‘? Watch some clips from the Love Actually sequel. Oh, I’m sure I’m going to enjoy these as much as you do Rebecca! Scones are one of my favorites! I’m with Kaiya…I bet you’d be great at bagels! I’ve never made them homemade. I need some inspo!! Get your bake on! Have you read the Outlander series? My favorite books of all time and I am a voracious reader. First one written more than 20 years ago and there 8 so far. Waiting for next one. Just the tiniest bit sci fi but mostly historical fiction and of course love story. Author is Diana Gabaldon. It is now a series on Starz. They are making the 3rd book now and expected to air in Sept.
Oooo I would love to see some savory breads! Anything you touch is magic. Thanks for the recipe. Making these with my grandmother today-she’s always in the mood for baking and has all the ingredients. 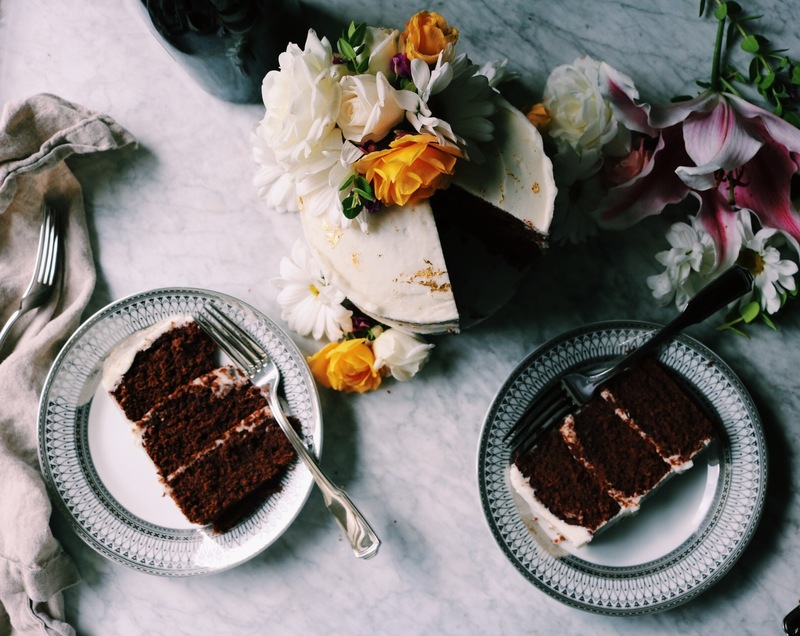 What brand of pastry/cake flour do you recommend? I’d love to see muffins with berries, stone fruit, honey, and lavender. These look crazy good with that icing all over them! Love how you say “if you don’t care for chocolate…” Ha, ha, is that even possible? Can’t wait for Love Actually! Hi Rebecca! I love your scones but I’d love to see something like croissants or bagels? Love your blog & Insta!